The Dome of the Rock on Temple Mount was the first monumental piece of architecture in Islam. It is odd that it was not a mosque or mausoleum but a structure to shelter a rock. It stands at the site of the First Temple built by Solomon and covers a rock which, according to tradition was the site of the Binding of Isaac by Abraham and Prophet Muhammad’s Night Journey to the heavens in early Seventh century. 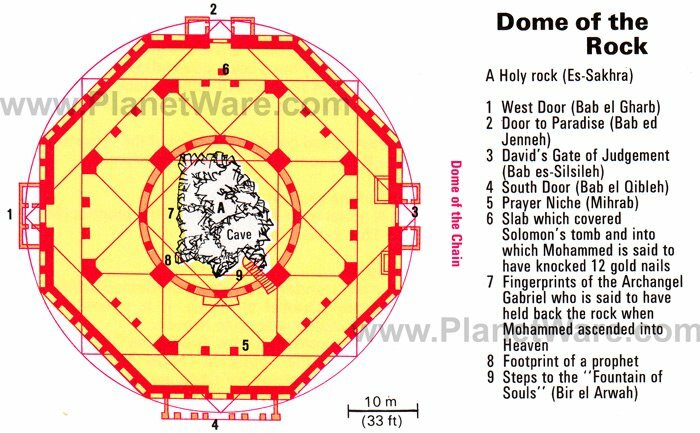 The rock underneath the dome was sacred to Jews and to a lesser extent to Muslims. It can be safely assumed that the structure built over it had no religious purpose except to provide shelter from weather elements to pilgrims. The building was constructed between 687 and 692 AD by Umayyad Khalifa Abdl Malik. The Arabs were desert nomads and did not have a well-developed architectural tradition certainly not the kind they found in Syria left behind by the Byzantine rulers. Arabs borrowed freely as long as it did not impinge on their core religious beliefs. They employed Byzantine-Christian accountants, tax collectors, and technocrats to rule a vast empire. Syrian architects and craftsmen well versed in Byzantine building methods helped in the construction of the Dome of the Rock. This building had no precedent in the fifty year old Islamic world except in Byzantium. Roman-Byzantine influence is apparent in the geometric lay out of the building, its interior mosaics, marble columns and overall sophisticated proportions. However, the remarkable thing about this structure is not just the influence of Byzantine architecture but also the emergence of an Islamic style. A style of surface decoration rich with geometric paterns and devoid of human and animal representation. The use of a circular dome sitting on a high drum also became the hall mark of later Islamic buildings. The blue glazed tiles and the band of calligraphic inscriptions on the upper portion of the facade were added 800 years later by the Ottoman Turks, giving the building a distinct Islamic flavor as we know it now.